Almost half of web visitors will abandon a web page that takes longer than 3 seconds to load. When you fail to deliver your site fast enough, you will lose visitors (and conversions)—and Google thinks you should too. In 2010, Google began using Site Speed (how quickly a website responds to web requests) as one of 200 factors that determine search rankings. If your page load speed is too slow, it can hinder your site’s ability to be found on Google’s SERP. While the impact of site speed on SERP rankings only affects fewer than 1% of search queries, Google’s acknowledgement of speed—as a critical factor—speaks volumes. Google constantly adjusts its algorithms to provide Google users with the best possible user experience—so it makes sense that a site’s speed can affect its SERP position on Google. How Fast Should My Avg. Page Load Speed Be? Critical Render Path: When all files ‘above the fold’ are fully rendered. How Do I Optimize My Page Load Speed? Find out how your site’s page speed stacks up at: WebPagetest.org, or Google PageSpeed Insights—and follow the suggestions. However, not all CDNs are built the same. If you choose a CDN provider known for outages, you wind up with downtime, which is obviously not only bad for your users—but, also your SEO—since search bots are unable to crawl your site. You must choose a CDN that can offer 100% uptime. Fastest file throughput delivery—which reduces TTFB, thereby decreasing your average page load speed. Global POP coverage, distributed in six continents—to deliver your site closer and faster to your users. Automatic gzip compression, to compress your image files on the fly—optimizing delivery and reducing bandwidth costs. Infinite scalability to scale on demand to traffic bursts—eliminating the risk of crashes and timeouts. Security, including: Token-based auth, and URL/referrer blocking, and origin shield. What you get is a faster loading site and the highest availability, which will help increase your SERP ranking and more importantly—provide your users a better experience. 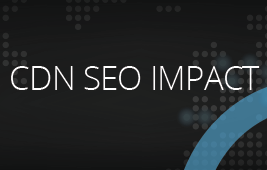 Don’t let slow load times affect your SERP ranking. Start optimizing your site speed today. Contact us to schedule an appointment with our CDN experts, who can evaluate your needs and determine a custom-fit solution for you.